Be Certified in all 3 Disciplines! After learning the information in the 85+ hour MZed Pro Member Cinema Sound course, you’re one of the elite masters of creating powerful Hollywood immersive media for audiences. 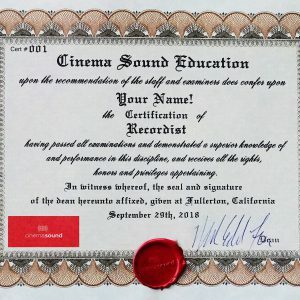 Why not certify your knowledge for all to see by investing in ALL THREE of the Cinema Sound Certifications? This bundle allows you to save $50 off taking all three separately. There is no time limit to complete these exams, so why not get the best value? The “General Audio” certification is a small fraction of the respect and declared mastery that all three of these Certifications grant the owner. 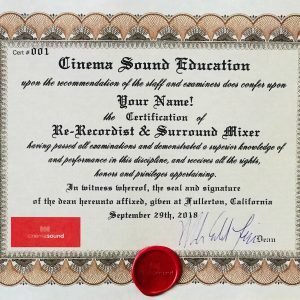 These exams cover all of the aspects of Cinema Sound 85+ hour course but in a far more in depth way as compared to the single “General Audio” Certification. 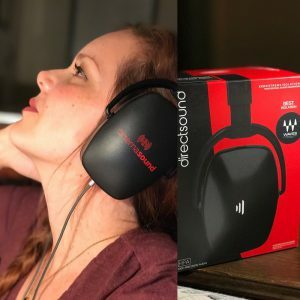 There is no equivalent bundle of exams anywhere and no certification that has more value than being confident about the ability to handle all aspects of sound in production and post for small and large format projects and create Hollywood-level audience impact in stereo and surround sound. You’ll have as much time as you need to complete the exams, and you may review the Cinema Sound education at your leisure (advised). • Digital download of the examination course materials including .pdfs of the exams, and audio files for examination. • Physical Certificates for each Certification (3) signed by Mark Edward Lewis with a unique certificate number authenticating them along with the wax seal of Cinema Sound upon receiving a passing grade. • The posting of your name as a “Certified Cinema Sound Member for…” each Certification on the Cinema Sound website for all to see – you may even include contact information if you’d like visitors to contact you about employment upon receiving a passing grade. • The possibility of being interviewed for Cinema Sound articles. • The opportunity to take each exam twice. Passing grade is 80% for each. There is EXTENSIVE mixing and recording examination requirements using a modern DAW including the need to import OMFs. It doesn’t matter what DAW as long as it can mix at a minimum of 5.1. You’ll also be required to do recording and you’ll need access to, at minimum, a shotgun microphone and recorder but ideally a lavalier or two. If you don’t pass the first time, you’ll be shown the answers you missed, but not the answers themselves. You can take as much time as you need between attempts. There are no negative points possible for the Extra Credit portions, so you have nothing to lose there! This is a great, no pressure opportunity to certify your new vast knowledge of sound and production/post audio. This bundle is all three of the specific disciplines of Cinema Sound Certification combined and is far more powerful than the single General Audio Technician Certification alone.